In 1960, BR Chopra released his suspense-thriller Kanoon. 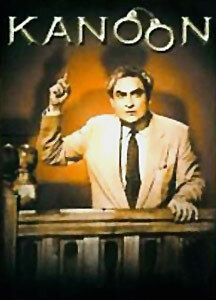 It was mainly a courtroom drama that raised relevant questions on the judicial mechanism, with the subtext of a murder. This film is widely considered as the first ‘song-less’ Hindi talkie. I am not sure about that. But Kanoon, definitely was, and remains, one of the best films to be made in Hindi. Not having songs was one tool that ensured that we do not deviate from the track, making it more powerful than other thrillers like Teesri Manzil (1966), but that was not the only creative decision that resulted in a great film. The entire procedure adapted for the film contributed. The writing was flawless. There is hardly any second in the film that is not relevant, something that can not be said for most Hindi films. The performances are restrained and moving. Apart from Ashok Kumar, who is always powerful in any role he plays, we have an aptly cast Nanda who plays her part beautifully and we have a restrained, underplaying Rajendra Kumar, proving yet again that he was the director’s actor. The sense of purpose is so defined in the film that although it has Mehmood in a brief role, there is no comedy scene by him, something that was difficult to achieve in those days. Those were the days when even Guru Dutt used Johny Walker to add a comic relief to his otherwise intense films, which in my opinion was the only avoidable creative judgment made by him. And here we have Kanoon. I am tempted to say that aesthetically speaking it is one of the best flawless films in Hindi cinema history. The pacing of the film, the way Chopra plays with time is remarkable. There is a scene where someone’s letter in the courtroom proclaims that he knows the culprit and he would name him after five minutes. We actually sit through that time, which runs for close to three minutes and half, and the tension that builds is a cinematic achievement. 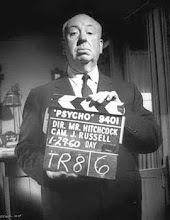 The director’s use of light and shadow, of sounds and silence, and the way he goes into exploring the psyche of his characters – all is reminiscent of Hitchcock, no doubt. But after all each suspense film made in the world is and will be compared to the Master’s style as it was he who invented and defined this genre. Kanoon is Hitchcockian, but looks like a worthy project by a student of Sir Alfred. After all, we can not take the credit away from Sholay, although its striking similarities with the best of the Western films clearly prove what its ‘inspiration’ was. The only weak point in the film, although I was fine with it, is the revelation of the real culprit in the end. It is something that has been done to death and perhaps the audience today would not approve of that. But the path it takes to reach the end is an unforgettable experience in itself and I would recommend Kanoon to all. However, in spite of being critically and commercially successful, it failed to set a trend. A film without songs is a weak proposition in this country and finds few takers. Nine years later, BR Chopra produced another song-less thriller, set more-or-less in a single night’s time. The film was the Rajesh Khanna starrer Ittefaq, and was directed by the younger Chopra – Yash Raj. Nanda featured again in this film and this time her character had a lot more to do and convey than the innocent girl of Kanoon. 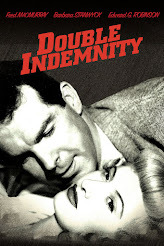 This film was made in Eastmancolor and the inherent suspense associated with Black and White was missing. But there were other deficiencies too. While BR Chopra’s camera plays with images in a subtle and layered way, Yash Chopra has made it too obvious and on the face. His fascination with the medium is what comes through in the first viewing itself, a trait not indicative of great cinema. And adding to that is the performances of the lead pair that appears unconvincing and over-the-top at least during the earlier part of the film. As the suspense is resolved and you think in retrospection, even that seems to be justified, but it does not essentially make you desire a re-watch, unlike Kanoon. Comparison in cinema is a useless and unreasonable exercise. But here, taking example from two films of the same genre from the same production house and within a span of less than a decade, each winning the Best Director Filmfare Award in their respective years, I want to insist on the essential ingredients of good cinema. This comparison clearly suggests that while Kanoon was an improvement over its script, Ittefaq was only saved by its writing. While the background score is one of the merits of the first film, it is disappointing in the second. The natural growth and assimilation of artistic expression that starts from the written word and moves to mixing, looping and score, which is celebrated through Kanoon, is unfortunately missing in Ittefaq. Although, Ittefaq remains one of the better films of Yash Chopra and Hindi cinema in general, and it also is recommended, comparing these two films reiterated my core belief. It is true that filmmakers have always defied convention and stretched the limits of the medium. But the importance of a cohesive, coherent cinematic vision, which begins from the paper and ends on the editing table, is a law of cinema. You can do away with it and still somehow put together a decent stuff through your inconsistencies, but that, perhaps, would not be more than a plain coincidence. Perhaps these words of Sir Alfred Hitchcock state the law I am talking of: there are hundred ways of doing a thing, but there is only one right way. Looking for and achieving that one way is the difference between great and not-so-great cinema. 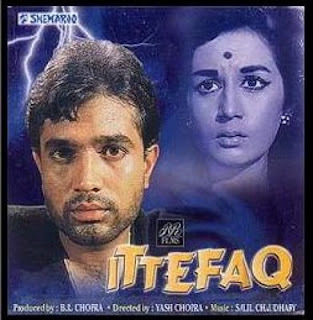 An interesting trivia about Ittefaq, was that it happened by accident. That year Yash Chopra was making Aadmi Aur Insaan for BR FIlms in 1969, and due to some unwarranted 2-3 months gap in shooting schedule, they hit suddenly hit upon making this "small" film that would be wrapped up quickly within the time.. and boy, that small film won him the Best Director's award... I came to know of this in the special features of Ittefaq, that featured a one-on-one conversation b/w the Chopra brothers! the comparisons between the two brothers' style was inevitable...........but, kanoon-because of its black and white photography, a key feature in whodunits in the sixties, was superb. yasdid manage somehow to pick up a directors award-but it was kaka that saved the film! While I had not an occasion to see Kanoon-the VCD I got was grainy and inaudible, and in a dilaogue-centric file, where you have to strain your ears for every word, my viewing/hearing experience was not very enjoyable. 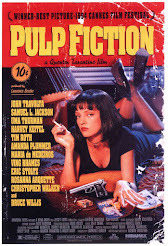 Yes, there were a few directorial flaws in Itefaq-but I really liked the music. Salil Chowdhury set the background score, appropriate to a Hitchcockian flavour, though comparisons are odious. He need not have to create a western score, but for an obscure reason, this genre seemed to suit better than sarods and sitars. The score lent an air of sophistication to Itefaq. 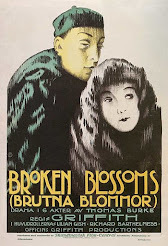 In the end, I am happy that our modern day film makers have not thankfully gone for remakes of these films, as well as Jagte Raho, Bandini, and so on. The way Lawrence of Arabia was never attempted, nor Casablanca. And neither Citizen Kane.